Deficiency cold in the uterus causing infertility, amenorrhea, scanty and prolonged menstrual bleeding or irregular periods. Dysmenorrhea due to deficiency. Also fatigue, dry skin or hair, weak or cold limbs or dry lips and mouth. Infertility due to cold in the uterus are some of the imbalances satisfied clients have used this product for. 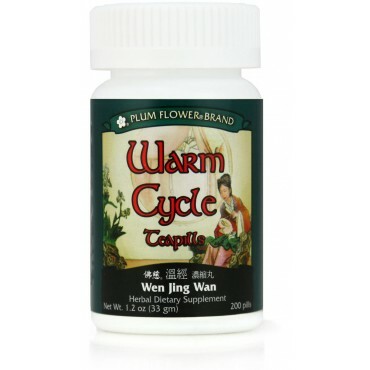 Warms the Uterus, Dispels Cold, Tonifies Qi, Nourishes Qi and Blood, Nourishes Yin, Benefits Yang, Invigorates Blood. Evodia rutaecarpa fruit, Pinellia ternata rhizome, Ophiopogon japonicus tuber, Angelica sinensis root, Paeonia lactiflora root, Panax ginseng root, Rehmannia glutinosa root-prep, Glycyrrhiza uralensis root, Paeonia suffruticosa root-bark, Zingiber officinale rhizome-fresh, Ligusticum wallichii rhizome, Cinnamomum cassia twig. - Wu zhu yu, Ban xia, Mai men dong, Dang gui, Bai shao, Ren shen, Shu di huang, Gan cao, Mu dan pi, Sheng jiang, Chuan xiong, Gui zhi.